Our fireplace was on in the morning but by the afternoon Kole was in the pool trying to “drain” the extra water with his squirt gun. :) I lost interest in the football game half way through and started organizing (no surprise there). Excited to share what I’ve been working on soon! 1 – Fresh Bath and Shower Gel – My friends LOVE Fresh bath products! I’ve been wanting to try them for a while now. Fun V-day gift! 2 – Sugarfina Candy – Have you all tried Sugarfina candy yet? It’s seriously so good! These Kiss Me Sugar Lips are my favorite! Dangerous stuff to have in your cupboards, but perfect for a V-day splurge. 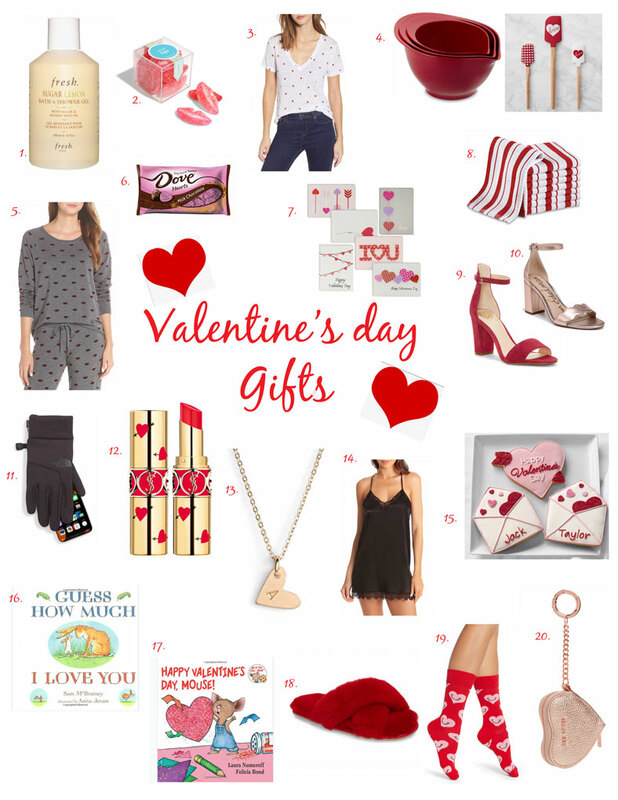 :) They have so many fun Valentine’s Day gift ideas! 3 – Rails Heart Print Tee – Such a cute top for all year but especially in February. I love Rails but it can be a pricey brand! I also love this heart tee and this cute Lucky tee for this time of year. And how cute is this top for little girls!? 7 – Valentine Love Cards – Such a cute set of cards to send someone a special note. 8 – WS Red Striped Dish Cloth – WS striped dishcloths are my very favorite! A set of red stripes would definiltey brightens someones Valentine’s Day. 9 – Vince Camuto Ankle Strap Sandal – I’m in love with these red shoes! Perfect for a night out. I have them in tan and they are so comfortable for a heel. Plus they just got marked down.. 50% off! 10 – Sam Edelman Odila Sandal – I’ve also been debating these cute blush gold sandals for Spring. LOVE them! 11 – North Face Etip Tech Gloves – Perfect gift for the man in your life if you are living in cold temps right now! These gloves are touchscreen compatiable and allow natural movement so they are also great for outdoor exercise and activities. 12 – Heart and Arrow Rouge Lipstick – I’ve wanted to try Yves Saint Laurent Lipstick for a while now (I’ve heard it’s amazing!) and would love getting this as a V-day gift! 13 – Mini Heart Pendant Necklace – Such a cute personalized gift idea! I love this for my teen girls too. This initial heart bracelet is another fun similar option. 15 – Personalized Valentine’s Day Cookies – These giant personalized V-Day cookies are too cute! Such a fun gift for anyone. Order by this Friday! 17 – Happy Valentine’s Day Mouse! – Another Valentine’s Day favorite of ours! 18 – Mt. Hood Genuine Shearling Slippers – These cute slippers have been on my wishlist for a while now! They come in 4 colors and are too cute. I want them for Spring/Summer because they don’t look as hot as the Uggs I live in during the winter months. If I’m home I have on some type of fuzzy socks or slippers.. always! 20 – Heart Coin Case – Such a cute little coin case to attach to your bag or to use as a keychain! I would love this and so would my girls. Fun ideas, thanks for sharing. 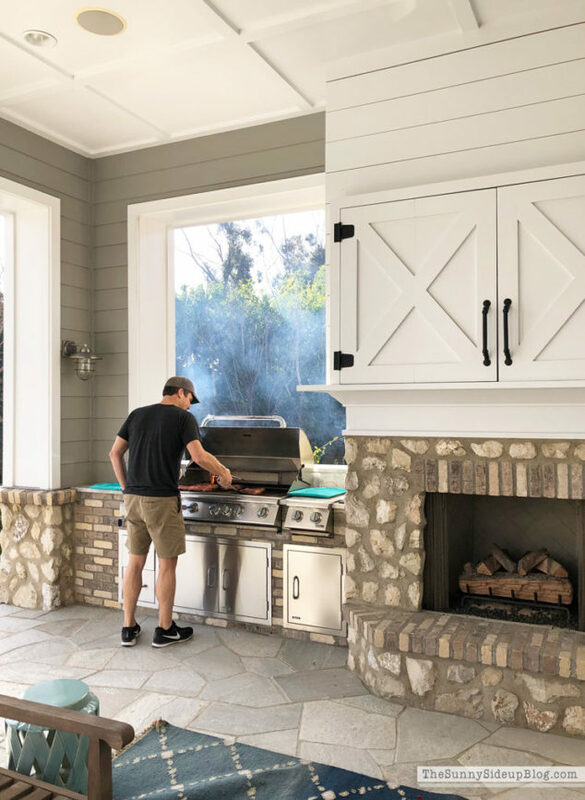 How awesome that your hubby could grill and do so in shorts. And that your sweet son could spend time in the pool. Gotta love SO California! We were feeling spoiled that it was in the 60s near Denver! But, of course they have to let us know that more snow is on the way. LOL Hope you have a great week. I watched/listened to the game and kind of lost interest, too. Hope you have a terrific week! Thank you for the great ideas, really appreciate them (and you). I read you from Belgium for months and this is the 1st time I dare to leave a comment. I love your blog and how you’re “real” in your articles, not pretending to be perfect, like when you totally accept that you’re not the best cooker in the world (and that would have been unfair anyway, you already have so many other talents !). So what made me finally dare to comment ? I was reading your blog during my lunch pause at work after a quite rough morning and I really wanted you to know that you made my day with your advice to all women to get the Glisten chemise for their partner. I did not understand what you meant as I was first imagining my husband in that outfit and no need to say I was in stitches ! Don’t worry, I then caught what you meant (I’m blonde but not THAT blonde !). Thank you for that huuuuge laught that brightened my day !